I just joined this forum hoping to seek information from expert members here. 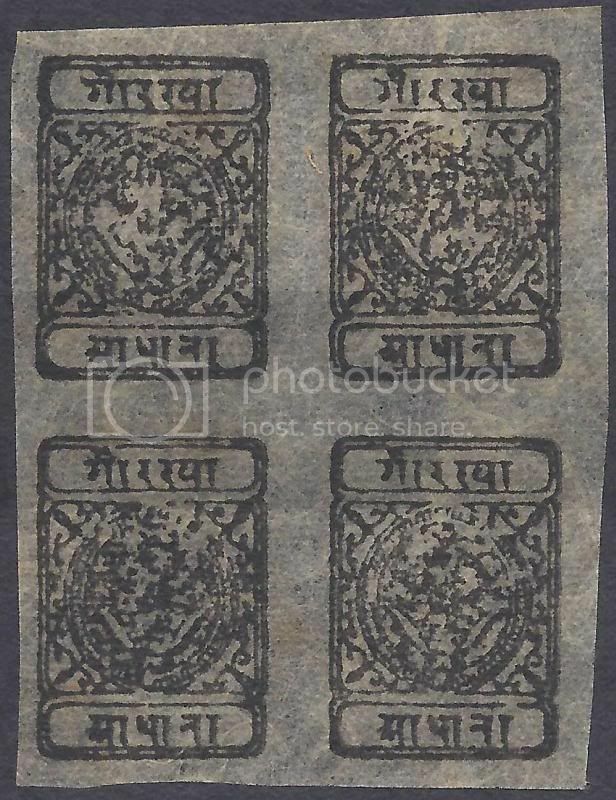 I am quite fascinated with Nepal stamp of Siva's Bow and Two Khukris. Can anyone share their stamps here for me and us to view. Or do you have any website link that I can go to have a peek at their stamp? Thanks in advance for your kind sharing or assistance! Many thanks for your prompt response and giving me links to scans! It is an eye opener for me and your website is fantastic! Even though mostly written in German language, the images are captivating and interesting! for my website I choosed examples with clear printing. The ½ Anna black is from setting 1 in 1899; later settings always show more or less blurred printings. The printings of the ½ Anna orange, starting in 1917, are always unclean. Many forgeries exist, sometimes not easy to identify. Thank you for your explanation! Later settings for ½ Anna black getting blurred is understandable. But why is ½ Anna orange are always unclean? Many forgeries exist is it mainly for ½ Anna orange which is more rare and expensive? Let me show you my ½ Anna black here. Please advise whether this one is a forgery or genuine? Thanks! the ½ Anna orange is setting 6 (1917). Therefore the printing is blurred like the ½ Anna black of those days. Yes, many forgeries exist of the ½ Anna orange because it is rare and expensive. There are also forgeries of the ½ Anna black. There is also a fake of a complete ½ Anna black sheet on my website. Your block of four looks like a fake to me. Please compare the upper inscription “GORKHA” (Nepal) and the lower inscription „ADHANA“ (½ Anna) with an original stamp. Is the printing of ½ Anna orange made using the same cliche used to make the ½ Anna black but using the orange ink? Why is ½ Anna orange rare? Because less is produced or destroyed? Thank you for the links to discussion on forgeries! Lol! I just realised that I have made a mistake in my scanning due to my ignorance and low level of knowledge for Nepal (and Tibet) stamps! I have mistakenly scanned the back side. The paper is so thin that the ink can be seen on the other side. I have rescanned the front (correct) side and here it goes. Do you still think it is a fake? haha, the inscriptions look much better now. However, this kind of blurred printing looks a little bit strange - though I also have a sheet of setting 7 with some stamps looking like your block of four. To say if it is genuine or fake I would have to feel the paper which looks very thin on your scan. Then again this ½ Anna stamp is not rare, and I am sure you will get many more good examples or sheets. Thank you for your reply! Yes you would need to feel the stamp to be able to determine whether it is genuine or not. 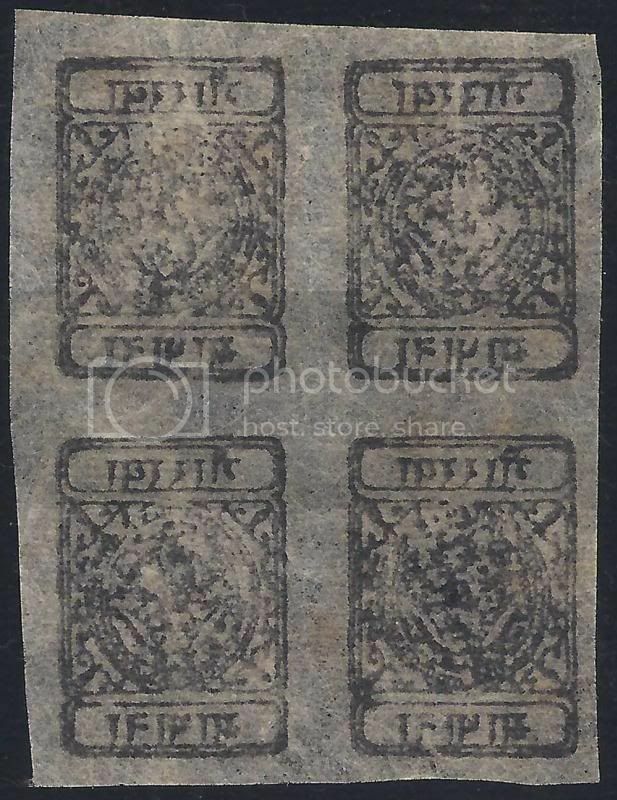 And yes ½ Anna black stamp is not rare and I could easily buy online from the internet. But I only have this piece among the collections that I bought off from a German Collector who sold it to an antique Dealer. His collection comprises of 1 piece only for each type of Nepal and Tibet stamps. I don't really collect Nepal and Tibet stamps, but since I have them, I just wanted to know more information. I was surprised to learn that there are so much forgeries due to popularity of these stamps!